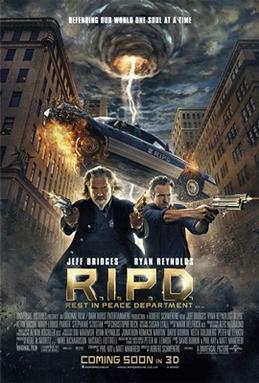 When I first heard of the film R.I.P.D., in my naïve nature I thought it was a comedy that stood for Rhode Island Police Department. I never read the Dark Horse Comic book series R.I.P.D. (the Rest In Peace Department) is based on, but from what I saw in the film the actual story, on paper, is probably highly interesting. I can't say entertaining or brilliant but interesting nonetheless. R.I.P.D. the film, however, is a hopeless mess, done in by a story that goes nowhere (after going in circles), dumb, predictable, and a sheer waste of everyone's time. 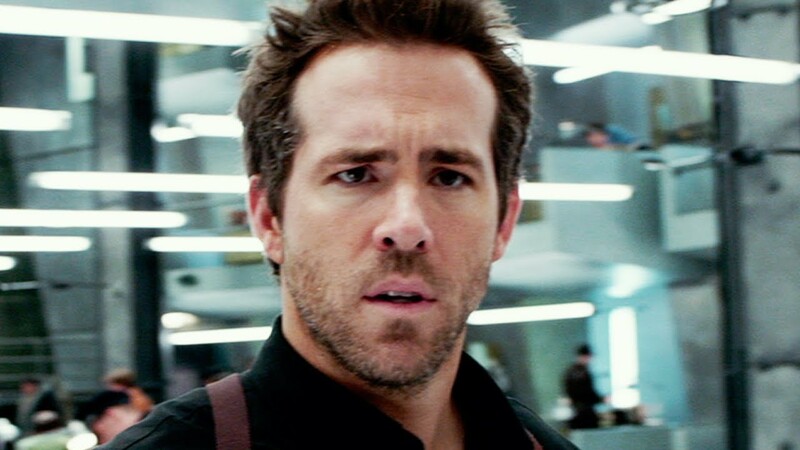 Told in voice-over (and longtime readers KNOW what I think of voice-over), we begin with the last day of Boston Police Detective Nick Walker (Ryan Reynolds). He's married to the pretty Julia (Stephanie Szostak), but Nick is no good cop. He buried some gold he and his partner Bobby Hayes (Kevin Bacon) had taken from a raid. Greed of course, kills, as Hayes quickly kills off Nick during a raid. Nick gets swept up to a netherworld, where the Proctor (Mary-Louise Parker) offers Nick a choice: either take a chance with Judgment or join the Rest In Peace Department. The R.I.P.D. finds people who escape Judgment and masquerade as living humans. These Dead-Os are to be returned. Nick decides to join the force, but is none too pleased to be a rookie, especially to his new partner, Roycephus Pulsypher (Jeff Bridges), a Wild West sheriff who still wears his cowboy hat while driving a modern car. Now, how do they get around Earth when they both are dead? Simple: to the world they appear to be something other than how they look. Roy looks like a hot model (Marissa Miller), while Nick gets stuck looking like an old Asian man (James Hong). This incongruous pair hunts down Dead-Os, but Nick still can't let Julia go. In their first capture we learn not only that Indian food can ferret out the dead but that there is some connection between the Dead-Os and the buried gold. Through an informant for the R.I.P.D. we find that the gold Hayes and Nick stole has something to do with The Staff of Jericho, which when assembled can reverse the ascension of the dead to Judgment and send the dead back to Earth. Hayes, of course, knows all this because, well, think as to how Hayes would know about this object that can bring the dead back to Earth (not to life, but to Earth). Despite their bungling (such as how they allowed a Dead-O to be seen in all his grotesque glory by humans in his natural state), Eternal Affairs (yep, Eternal Affairs) may overlook this (unofficially) to let the boys bring in the Dead-O gang and save Earth. Somehow, when I think of R.I.P.D., I kept thinking how, within the pages of the comics, it might have worked. The switching from Nick to the old Asian man would be almost clever. I think comic books have a greater freedom to allow bizarre premises to be accepted (such as Indian food being a trigger to unleash the Dead-Os to their natural state), but something got lost in translation from the graphic novel to Phil Hay and Matt Manfredi's screenplay (with story by Hay, Mandredi, and David Dobkin). It may be not be all R.I.P.D. 's fault that its story is veering dangerously close to being a knock-off of another comic book-based film (Men In Black) in terms of story with the dead taking the place of MIB's aliens. It just has the misfortune to have come in long after Men In Black's glory days where comparisons are pretty much a given. Even if we allowed that the stories of Men In Black and R.I.P.D. are similar, so much more makes R.I.P.D. an embarrassing disaster and sheer waste of time. Everything within R.I.P.D. is so idiotically predictable (the villain gets caught so willingly! the odds the Staff of Jericho, a plot device to keep the story going, would be the same thing Nick has!) and almost rushed. We get that there's this supposed romantic undertone between Proctor and Roy, but nothing, not even their overt hostility, suggests they even know each other, let alone had some sort of passionate affair. Other things that might work in the comic (transporting from the RIPD office to Earth via a bathroom that takes them to a VCR repair shop) is so unfunny on screen. The few times we see the Old Asian guy and the hot model makes this more inconsistent, and then we get wild inconsistencies in R.I.P.D. 's own internal logic. When one Dead-O appears he is so massive it goes on a rampage through Boston, destroying major buildings and clearly visible to humans. However, we have to accept that this would never have happened before. How is it even possible that these giant CGI creatures wouldn't go unnoticed? Bridges made a parody of his Rooster Cogburn from True Grit and it is up for debate whether it was intentional or not, whether he was devouring the scenery because he knew he was stuck in junk or because he decided it was the only way to save what he could from this debacle. Reynolds is the one who really makes a right mess of things. His expression never really changes throughout R.I.P.D., and given that he's been in bomb after bomb (as well as how he can actually act but keeps getting pushed to 'leading man' roles that give him nothing to do but look pretty) this will only make things worse in terms of career. The comedy isn't funny. The effects aren't convincing. The story is idiotic and predictable. When Roy starts literally singing the blues, I figured the film had jumped way off the rails and there was no way of getting it back on. Worse, to suggest, even ever-so-slightly, that there might be a sequel is flat-out insulting to the audience that suffered through all this. R.I.P.D. should be shot on sight. If I can the movie on TV or something I might watch it, but other than that R.I.P.D. seems like a movie to skip. Just a heads up, your first picture isn't loading, and the Dashboard just has a blank image.